At a luncheon at the Anglican Centre after the inaugural mass, Bishop Christopher Epting and I learned that our audience with Pope Benedict XVI was confirmed. I had to change my travel plans once again... and then again, when later we learned there was to be a press conference afterwards. 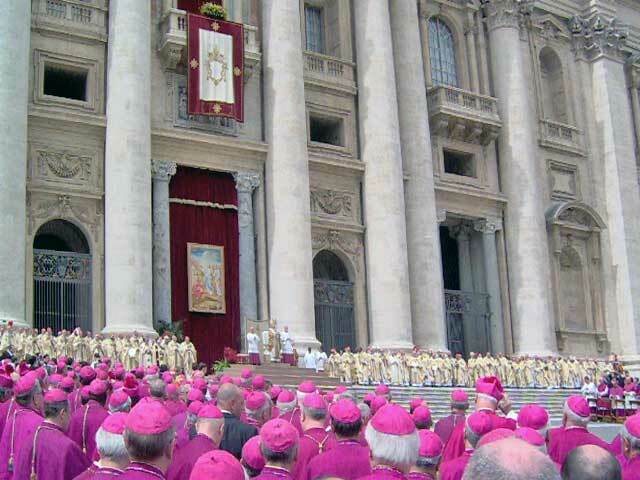 A sea of Roman Catholic bishops at the inauguration of Benedict XVI. Carrying the German-English Prayer Book from Florence (don't leave it behind! ), I took a cab with Bishop Epting to the same meeting place as the day before, and climbed into a bus for the Vatican, again escorted by several carabinieri outriders. The same cohort of Anglicans that attended the papal mass descended from the bus, acknowledging clumsily the salutes of the Swiss Guards (I always wonder whether I should salute back). This time we came in through the back entrance to the Vatican apartments, instead of the basilica, and made our way up to the Clement VIII room, a smaller version of the large formal audience room where John Paul II had officially welcomed me to Europe almost four years ago. 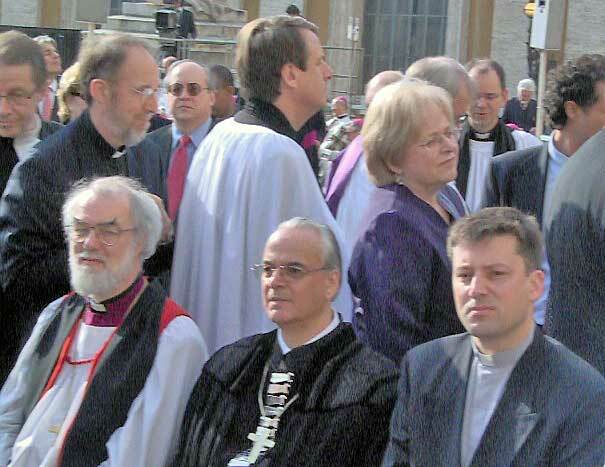 The Archbishop of Canterbury and some of his party at the inauguration of Benedict XVI on Sunday, 24 April 2005. The contrast with that audience was striking. In the courtyard, William Cardinal Keeler of Baltimore welcomed us, and reminded me to my amazement that we had met before at that audience in 2001. As we walked into the audience room, Cardinal Kasper welcomed each of us warmly. To me he said, "Ah! We have the whole Anglican Communion here today!" We were seated in a horseshoe shape around the room, Orthodox to the Pope's right, Anglicans to his left, and Muslim and Japanese Christian delegations in front of him. We rose as Benedict XVI strode in. He turned and waved at us with both hands, palms out, as he had done to the massive crowds the day before. (Remembering how John Paul would make his well-known two-handed welcoming gesture with his palms turned toward his body, I wondered whether Benedict is careful to wave palms-out.) He sat and read a complex statement in Italian, French, and English, concerning the search of unity and the need for concrete steps toward it. We had had no briefing on how the audience would be conducted. Would we have a chance to give gifts? Would we process up to the seated pontiff, each to be greeted quickly and photographed professionally? To our surprise, Benedict stood up and went directly to an Orthodox metropolitan, the ranking bishop on their side, and began chatting. Cardinal Kasper followed him around, as well as two cameramen, still and video, and the Vatican "gentlemen" (the housemen). Looking relaxed and genuinely pleased, he moved from one to the other, exchanging firm handshakes or formal kisses with the appropriate Eastern bishops. Then he came to the Anglican side, where Benedict and Archbishop Rowan Williams exchanged lively greetings. The Archbishop presented the Pope with a pectoral cross based on the ancient Canterbury Cross design, and he invited the Pope to visit England when his schedule permits. The Pope replied enthusiastically. Down the line of bishops he came, taking his time with each. One special moment was the meeting with Archbishop Joris Vercammen of the Old Catholic Churches of the Union of Utrecht. (We celebrate next year the 75th anniversary of our full-communion agreement.) They exchanged kind words and spoke of meeting again. 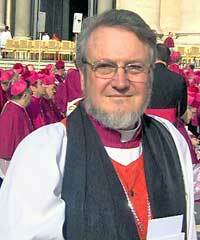 My colleague Geoffrey Rowell, Bishop of Gibraltar in Europe, was next to me. He and Benedict recalled their meeting some years ago and even the specific topics discussed. Then it was my turn. The Pope shook my hand (I did not, like some other Anglicans, kiss his ring.) I introduced myself. Benedict looked at me warmly and asked whether I worked from the States. "No, Your Holiness, I live in Paris where we have our cathedral." "Oh, Paris? I did not know this. Do you have churches around Europe too?" I replied that we do, including in Rome. Seeing the increasingly desperate looks of his staff behind him, I then said that as his predecessor had honored me by formally welcoming me to Europe the day before my consecration here in Rome, it was an especial honor to be able to offer His Holiness the greetings of the Episcopal Church and the Presiding Bishop, with our congregations in Europe. I then presented the German-English Book. Hand-bound in leather by a Florentine craftsman, it is a pleasure to hold in the hand. I showed him the bi-lingual text. He took it and showed it to his compatriot Cardinal Kasper. "Look, Walter!" he said in German. "It is in German." They both looked pleased. I replied by saying in German, "We hope this will be useful for your prayers, Holy Father." Bishop Christopher Epting and the Revd Dr Michael Vono. With a final smile and nod to me, Benedict turned to Bishop Epting. 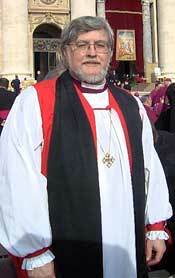 He introduced himself as the ecumenical officer of the Episcopal Church. Benedict changed demeanor. Looking at him intensely, he leaned forward and said, "We must take steps toward unity now!" He asked for his prayers, which Bishop Chris promised. They exchanged some other words, which I will leave for Bishop Chris to tell on his own. 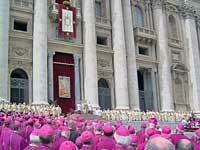 As the pontiff moved away, we looked at each other. What had happened? Clearly Benedict wanted to show that he is not confined to a chair. For almost two hours he held court, showing interest in the people he was meeting. Like the day before, he seemed to be enjoying himself a great deal, showing a gentle, unpretentious side of himself that those who know him say is quite real. Furthermore, his first audience as Pope was not to Roman Catholics but to the ecumenical and interreligious visitors at his inauguration. As the months and years pass, we shall learn what this actually means. I for one am willing to wait and see for now. The other aspect of this experience is that the Anglican Communion was well-represented at both the mass and the audience. Cardinal Kasper's remark upon seeing me showed that the Roman Catholic Church noticed that the Episcopalians came too. We were not shunted aside or left behind. 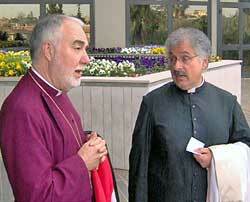 Furthermore, the Vatican did issue invitations for Bishop Chris and myself. Canon Kenneth Kearon, the new Secretary-General of the Anglican Communion, remarked that the Romans are keenly interested in how we will resolve our differences, as are the Lutherans. Can Anglicanism truly support a global communion of churches? Our issues reach far beyond our own Church. After the audience, we repaired to the English College, the English Catholic school in Rome, for luncheon and a press conference. There we all had a chance to chat at length with Cormagh Cardinal O'Conner, the brilliant Cardinal of England. I had met the Cardinal at Bishop John Flack's institution as Director of the Anglican Centre, but had not had a chance to converse at any length. He towers over me at 6' 5", a handsome man with an open face, easy smile, and pleasantly florid complexion. He was keenly interested in what the Pope had said to each of us. Both the Archbishop and the Cardinal together gave the press conference that followed. They have clearly become comfortable in each other's presence. After an initial statement by both, the press focused mostly on the Archbishop. Though manifestly tired, his replies were, in the opinion of the assembled bishops, nothing short of brilliant. To a lengthy question about how he could work with this new pope who had written so much to dampen ecumenical and theological dialogue, Rowan Williams began by recalling a book on the Church that Ratzinger had written in the 1970s. He concluded, "It is still fertile today, and will be for some decades to come." This is the first phase of the man's career, he said. The second phase was as head of the Congregation for the Sacred Doctrine of the Faith, in which he had to focus his fine mind on doctrinal precision. Now, said the Archbishop, the third phase has come, and he has a new job. One can hope for new things yet to come. To another reporter, who began his question about secularism by saying, "Now that the Church of England is a small minority church..." Cantuar replied that in the European context, all Christians are small minority churches, and that he would not accept that characterization of England. He went on to discuss, with Cardinal O'Conner, the different types of secularisms that face the churches in Europe. On the ecumenical movement, both men agreed that small concrete steps were much more useful in the long run than grand gestures. As I listened to both men, I was reminded of the biblical proverb, "Iron sharpens iron..."
Finally, this weekend was a great opportunity for Bishop Chris and me to have several long discussions with other Anglicans. First, I was very impressed with our new Secretary-General, who carries a strong intellect well with a disarming, down-to-earth Irish manner. Second, our conversations with bishops who are very unhappy with us gave us the opportunity to describe the extraordinary process by which the Covenant of the House of Bishops came to be: one can only say that the Spirit moved at our meeting in March. We were able to take the measure of continuing dissension from the decisions of General Convention 2003. There are serious differences and we Americans should not dismiss them lightly. Furthermore, there is a great deal of misinformation, especially around our attempts to implement Delegated Episcopal Pastoral Oversight. But disagreements among Anglicans are perennial, and to be expected. What I will always remember is that the Anglicans stood as one to represent the whole Anglican Communion to Rome and to the world, as a new papacy began.